In honor of Veteran’s Day I thought I would write a blog to you guys about one of the craziest military engagements of ancient history. Throughout human existence there have been these great moments when the courses of entire civilizations have been decided upon the courage of fighting men, the guile of generals, and the edges of swords. One such battle was the siege of Alesia, a fortified town in the Roman province of Transalpine Gaul, where Gaius Julius Caesar finally closed in on the Gallic general Vercingetorix. For years before this battle took place, Roman legions under Julius Caesar had been ravaging the Gallic countryside, bringing the region firmly under the control of Rome. At this time, the Roman economy had morphed into this beast that was almost entirely dependent upon foreign conquest and the subjugation of native peoples. Romans had settled in the region, and Caesar had been squeezing the Gauls for tribute for around six years. The Gauls, having been crushed by the Romans, were simmering at the Roman boot upon their throats. After a tribe called the Carnutes, who had been previously pacified by the Romans, rose up and slaughtered all the Roman settlers in the town of Cenabum, Caesar mustered his legions and marched over the winter-locked alps into the province of Transalpine Gaul to put down the rebellion. He was unaware that the major Gallic tribes had previously met and elected someone to take the fight to the Romans, to drive them from the lands of Gallia. That man was the chieftain of the Arverni tribe, and his name was Vercingetorix. Vercingetorix defeated the Romans in the field at Gergovia, and fought a decent field campaign against Caesar. The Gallic cavalry was much stronger than the Roman cavalry, and Vercingetorix was famous for using his mounted soldiers to devastating effect. After a few engagements between the two forces, Vercingetorix withdrew his army to the fortified town of Alesia. Caesar followed him, and trapped his forces within the city walls. Alesia was a relatively small settlement by our standards. It was built upon a solitary hill between two rivers, and overlooked a small valley that surrounded it. There was high ground beyond the valley, but Alesia would have had a decent view of the surrounding countryside. It was surrounded by a low wall that ran for around 5 miles, and probably had a fortified gate of some sort. It wasn’t a very large settlement, but by Gallic standards of the time, it was a well fortified position. Vercingetorix had some 80,000 men inside, along with thousands of civilians. Caesar surrounded Alesia with somewhere around 50,000 legionnaires and Germanic auxiliary forces. Imagine what a man like Julius Caesar would have thought when he looked up at the town of Alesia. By this time, Caesar was already a seasoned military man and commander. He was a strange figure in history, and there are famous (and infamous) stories about him in the Roman records. Caesar was a popularis–which would have been roughly the equivalent of a democrat in Roman politics, with a definite violent twist–and he was loved by the Roman lower classes. He was known to buck convention, and, in the words of Dan Carlin, was something of a “punk rock like figure of the ancient world”. He was said to have moved twice as fast and decisively as other men. Caesar was also fiercely loved by the men under his command. He regularly ate, camped, and fought with them, and earned their respect through his deeds. Caesar’s men supposedly loved him so much that, when they messed up in battle, they begged for him to punish them so that they could once again be in his good graces. Caesar heaped rewards and praise upon his soldiers, and they were fiercely loyal to him–something that would bode ill for the Republic in the future. Any one of them would have died for him without a second thought. Caesar was also known to be a military genius, and that will become apparent during the Battle of Alesia. Caesar knows that Vercingetorix has the advantage. The Gallic cavalry had devastated Caesar’s own mounted units, and from the high ground in Alesia he can send his horsemen out to raid the Romans virtually at will. Caesar has to neutralize the advantage that Vercingetorix has taken, but how to do it? He sets his men to digging. One thing that the Roman legions could do better than any other ancient army was build. Every single night a Roman legion would fortify their camp. They built walls in record speed, they brought tools and technology with them, coupled that with a fiercely industrious nature, and used it all to great advantage. 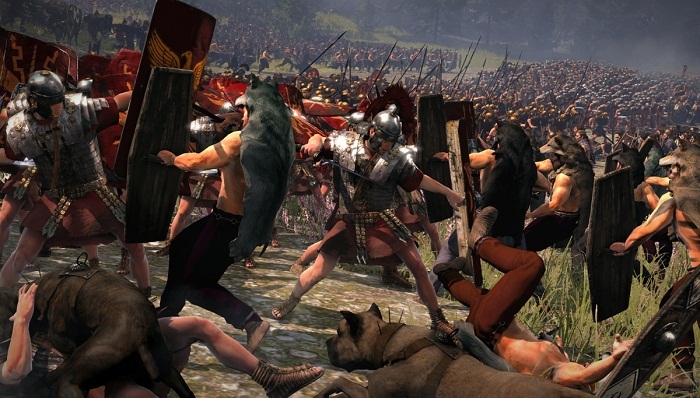 Caesar has his men dig a wide trench all the way around the city–a distance of around ten miles. After this wide trench is dug, he has them dig another trench and fill it from the water of the nearby river, creating an effective moat. After another trench goes in, he fills all of this with stakes, caltrops, and other nasty defensive surprises the Romans were famous for. He turns the ground around Alesia into a killing field. Then he sets the legionnaires to building a wall around the city, turning a defensible position into a prison–a tactic called circumvallation. Vercingetorix isn’t stupid, and he can see all of this happening from the city walls. He sends his best troops–that Gallic cavalry we spoke about–to raid the Romans building the wall, but the legion regularly pushes him back into the city. 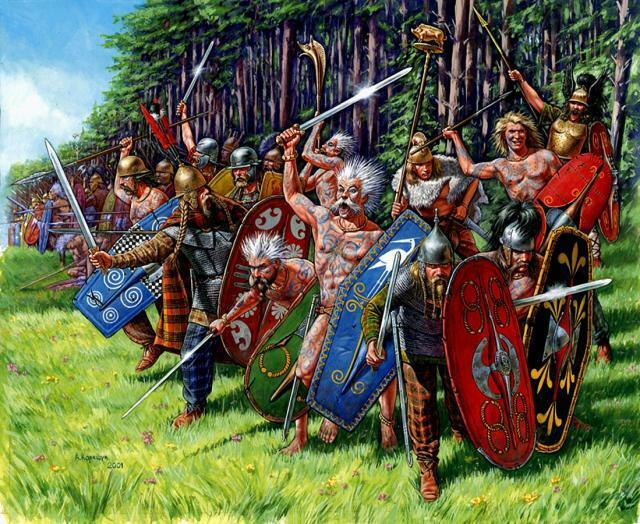 Roman legions were also good at defense, and Vercingetorix was unable to break through the Roman lines. Day by day, his sorties failed again and again. Finally, Vercingetorix makes what many people believe to be the mistake that sealed his fate–he sent his cavalry out into the countryside to rally the tribes for help. The move cripples his ability to harass the Romans building the wall. Caesar, ever the clever opportunist, uses the escape of the Gallic cavalry to his advantage. He orders his quartermasters to procure a supply of food from the surrounding countryside for thirty days, and sets his men to building even more fortifications. With the ability to build with impunity, the legions get right to work. They build a second wall around the first, and this one is around twenty miles in length–a line of contravallation. It goes up without incident, and in record time. Caesar makes his camp between the two walls and, anticipating the appearance of a Gallic relief force, prepares to be besieged while besieging Vercingetorix. Wild, huh? The walls that Caesar’s legion built had only one weak spot–the western side, where the walls met the river. After about seven weeks of being besieged, the people of Alesia began to starve. There is a small supply of beef and corn inside the walls, but Vercingetorix has seized control of the food for his men, and the civilians are running out of sustenance. What happens next is a strange thing, to be sure. Either Vercingetorix, or the tribal elders inside the town, decide to send out their women and children–some three thousand people–to the Romans. Doubtless these people thought that the Romans would hopefully let them through to safety, or even take them as slaves. Either way, from their point of view, they might avoid starvation, and the possible slaughter coming their way. Caesar, though, turns the civilians back toward the city. He denies them any sustenance or mercy. This might have been a cruel thing to do, but from a tactical standpoint, it’s quite devious. Caesar’s armies aren’t doing much better than the citizens of Alesia, as Vercingetorix had enacted his famous “Scorched Earth” policy and convinced the Gauls to burn their own crops before the Romans, and allow them no succor from Gallia’s fruits. The legions are struggling to forage food from the countryside, and they’re in hostile territory far from their home. Caesar knows he cannot feed these refugees, and doing so would place his own supplies in jeopardy–which might have been Vercingetorix’s strategy from the start. What he does next speaks to that intention, because Vercingetorix turns the civilians away from Alesia, too. He keeps the gates tightly shut. There are different estimates of the number of women and children that were left to starve in the killing fields between the city and the Roman fortifications. I know that this was a darker time, and these people were used to killing, but it’s hard for me to believe that the soldiers on both sides–not to mention the husbands and fathers of those left to die–could listen to the cries of the helpless without feeling some kind of sympathy for them. I couldn’t even imagine the sight. Vercingetorix eventually breaks, and allows the women and children back into the city. Caesar wins the battle of wills. Alesia is starving, Vercingetorix’s men are getting desperate, and he knows he’s on his last leg. Caesar now has the upper hand. It was in that desperate hour, however, that Vercingetorix gets the reinforcements he was hoping for. His cavalry has returned, having rallied the surrounding Gallic tribes, riding at the head of a force 60,000 strong. They are commanded by a man named Commius. They occupied some high ground outside of the outer walls of Caesar’s defenses, screaming and beating their shields at the enemy below. Caesar had anticipated them, though, and was prepared. Commius immediately sends in his cavalry, covered by archers from the high ground, at the small groups of Roman infantry that were outside the walls. They begin killing everything in their path, and Caesar sends his own cavalry out into the hills to counter the Gallic forces. A battle ensues where the Gauls slowly retreat, drawing Caesar’s cavalry into the range of their archers, where they begin to get cut down in a storm of arrows. Caesar orders in reinforcements, and they somehow manage to fight their way to a nearby hill. The Romans swing around and charge down at the flanks of Commius’s cavalry. The Gauls are routed, which leaves the archers to the mercy of the Roman cavalry. They are easily cut down before the Romans, and Commius is forced to pull his army back, losing a tithe of his mounted soldiers and almost every archer under his command. The victory emboldens Caesar’s men, and makes Vercingetorix even more desperate. Caesar, outnumbered over two to one, has managed to fight off a larger force while keeping Vercingetorix easily besieged within the walls of Alesia. Vercingetorix must have known that the help he was holding out for may not be his salvation, and it must have been crushing. The Romans were notorious for the things they did to the people that crossed them, and it was doubtlessly on Vercingetorix’s mind. That night, Commius and Vercingetorix launch a coordinated attack under the cover of darkness. The Romans had withdrawn within their defenses by this point, and Caesar had stationed his men along the wall in various strategic positions. Suddenly the Gauls come screaming out of the night from both directions, trying to fight their way through Caesar’s defenses and create a breach. Caesar reinforces his men on the outer wall, but the defenses and traps he’d left on the inner wall are wreaking havoc on Vercingetorix’s forces. The Gauls had to run through a field sprinkled with Roman style caltrops–called Goads–before passing through yet another field that Caesar’s men had dug with row upon row of buried, hidden traps with sharpened stakes. If one made it through this field, they then had to cross the moat, which also had traps inside of it. After that they had to battle through two separate trenches that were five feet deep and filled with a forest of sharpened stakes. Only then could they attack the wall. The entire time the Gauls would have been pelted with Roman arrows, javelins from ballistae, and stones from slingers. The grounds around Alesia would have been choked with the dead. Vercinetorix’s assault from the inside was suffering the entire weight of Caesar’s preparations. The outside assault under Commius is going better. The Gauls, by sheer weight of numbers, are putting a lot of pressure on the Romans. The fight for the walls goes back and forth, and the Romans nearly break more than once, but the quick actions of a young commander by the name of Mark Antony saves the fight. The Gauls are repelled from the walls and sent back into the night without the will to continue. It was that night that won Antony the respect of Caesar, and Antony became his right-hand man after the Battle of Alesia. The Gauls are pushed back from the Roman defenses a second time, and Vercingetorix retreats into the walls of the city. This was a crushing defeat for the Gauls. Vercingetorix, after having watched Caesar repel yet another attack by a larger force, must have been feeling the weight of destiny on his shoulders by now. The Roman general has managed to spend his forces at just the right times in order to win through by the skin of his teeth, and the people of Alesia are starving. Things aren’t looking good for the people of Gallia. They know they have to do something soon, or their cause will be lost. It is about this time that Commius finds the weak spot in Caesar’s wall–the one on the western side near the river that we talked about earlier. He sends in his men under the cover of night, and hides them near the river. The next day he springs his trap on the unsuspecting legionnaires, and a fierce battle ensues for control of the wall. Both sides are tired from the battle of the night before, but the Romans are still outnumbered more than two to one, and have to fight more often. They’re beginning to flag, and start to get pushed back into the space between the two walls–back into their camps. Vercingetorix sees this from the walls of Alesia, and orders his men to attack. At the same time, a third force under one of Vercingetorix’s cousins attacks the outer wall, and the Romans are beset on all sides. To the west, Commius has fought his way into the camp and is pressing the legion hard. On the eastern side the defenders are facing another army of Gallic tribesman on the outer wall, and Vercingetorix is pressing hard from the inside. Romans are being slaughtered everywhere, and for a time it seems that Caesar will die under the walls of Alesia along with all of his men. Caesar is standing atop a tower he’d made his men build into the defenses, watching everything happen. He can see that his lines on the western side–where the Gauls are streaming into the camp–are starting to break. If those legionnaires give way, the Romans will be routed and slaughtered to a man. It’s now that he does one of those things that he’s famous for, at least in his early history. He straps on his famous red cloak, rallies four cohorts of reinforcements, and leads them right into the teeth of the enemy, where the fighting is most desperate. This is where you have to remember what I told you earlier about the regard Caesar’s men had for their general. Caesar was like a combination of Patton, Kennedy, and Russel Brand to these guys. They loved him. They trusted him completely, and each one was ready to lay down their lives if he thought it was necessary. He had won their respect over years of campaigning beside them, and had taken good care of them along the way. Imagine if you saw your idol hoist a sword, yell “follow me, boys!”, and rush right into the worst of the fighting. When the legionnaires saw their leader charge down upon the enemy, a fire must have lit along the battlefield. Each man who was throwing javelins, or pelting the Gauls from a distance, was said to have dropped his missiles, drawn his gladius, and followed Caesar right into the fray. Right when their lines were about to break, the men at the front saw Caesar come rushing down into their midst at the head of hundreds of reinforcements. Suddenly their salvation had appeared, and they rallied to meet their fates. Commius had committed his forces to a narrow strip of land where Caesar had been unable to build up the walls enough to keep them out. He had somewhere around 40,000 men behind him, but as the numbers on the battlefield grew, the flaw in his tactics became apparent. The Gallic infantry basically just rushed down on their enemies with swords aloft, the way you could imagine any barbarian horde might do. The tight space they were rushing through started to choke their advance as more and more bodies filled the gap. This was exactly the kind of fight in which the legions excelled. Caesar pushed his advantage and tore into the Gallic lines, pushing their advance back to the weak point in his defenses. The Romans fought for their very lives, and with the advantage of numbers neutralized, began to slaughter the Gauls right and left. As the Gauls saw their countrymen being sliced down in droves, their attack broke, and they began to run away in fear. The Romans pushed their advantage and routed the Gauls, pursuing them all the way back to their camp. In one decisive move, Caesar took a full third of the Gallic army, and Commius’s forces melted away into the forests. Meanwhile, the forces attacking the outer defenses were unable to gain a foothold. The legions under Antony and Caesar’s other commanders continuously pushed them back. Vercingetorix fared no better against the circumvallation lines than he had before, and was forced to retreat back inside the city walls. Once the Gauls had learned of the destruction of their camp and the rout of Commius, the tribes retreated into the night. By the next morning, the battlefield outside of Alesia was deserted, save for the dead. Imagine the way he must have felt looking out over the destruction of the countryside, and the Romans camped outside of the walls. He must have known that Caesar was now free to attack the city at will, or starve them out in short order. The people were already dying, both of starvation and the continuous fighting. He knew that if the Romans were forced to breach the walls, the city’s innocents would probably be raped, killed, or sold off into slavery. I think the next decision he made was a noble one. He put on his armor, opened the city gates, and rode out to meet Caesar alone . The romantic version of the story has Vercingetorix being brought before Caesar, drawing his blade, and dropping it silently at his feet. Caesar takes Vercingetorix into custody, but in a surprising move, spares a large number of people inside the city. This was out of character for him at the time, especially on the heels of such a tough battle. Perhaps it was a political move designed to quell the ill feelings toward the Romans at the time–after all, the local tribes had been killing Romans for awhile at this point. Perhaps it was the beginning of Caesar’s tradition of clemency for his enemies, or perhaps Vercingetorix begged for him to spare the city. I have a feeling that the ones left alive and free were probably from tribes that Caesar wanted as allies in the region. Whichever thing it was that spared the people of Alesia, the same couldn’t be said for Vercingetorix. He was kept imprisoned for five years as the political turmoil in Rome upended Caesar’s life. During that time Caesar fought more wars against his own people, and maneuvered his way into being declared dictator in Rome. It was after his defeat of the Senate that Caesar organized his own Triumph–a huge party and parade that was considered one of the highest honors a Roman man could be granted–where Vercingetorix was paraded out for the plebians to see. There, after being paraded before the assembled people of Rome, Vercingetorix was strangled to death in a Roman dungeon. Gallia was subdued, and eventually became a Roman province. It would be around three hundred years before another uprising. Later in the Roman history, there would be campaigns to extend citizenship to the Gauls, who had become close to Romans themselves. It started bloody, though, as do a lot of things in history. I hope you guys enjoyed that little story. There are a lot of details I glossed over about the battle, and historians always disagree on a lot of details. Feel free to google it and read up on it yourself. It’s wild to think that this stuff happened, even in some way close to the story we accept today. I’ll update you guys soon on Child of the Flames, and don’t forget to JOIN THE CONCLAVE, like, subscribe, and all of that nonsense.